Last week on Thursday represented a day in the US stock markets where a morning opening gap up offered very low risk and high reward opportunity or tremendous risk, depending on your point of view and decision making. 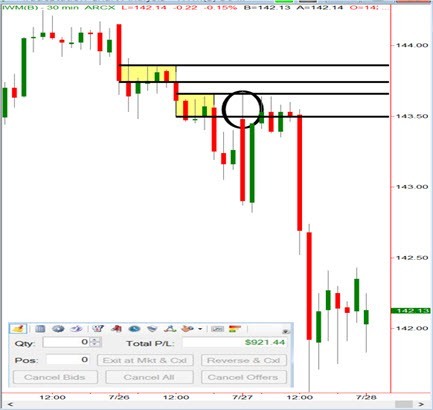 My morning prep work that day consisted of finding markets that are opening at price levels where supply and demand are out of balance in a large way and then simply trading them back to balance. That morning, the gap up was significant on news that was perceived positive for stocks so most of the world was buying. However, if your point of view is that of a smart buyer and seller of anything who has an understanding of the laws of supply and demand, not only were you not buying like everyone else was, you were selling to that huge group of buyers as prices were at levels where supply exceeds demand. Notice the price action on 7/27/17. There was a gap up on the open into supply (yellow boxes) followed by a dramatic price decline from the $143.50 price level in the Russell. This can only happen because there is much more supply at that level than willing demand. When this happens, price must decline. The dramatic rate of decline suggests a strong supply and demand imbalance at that level. While the rest of the world is buying in a strong way, the astute trader’s plan is in place well before the open that told us to sell to anyone who wanted to buy at that level. Why? Because you are selling to novice buyers who likely are consistent losing market speculators. How do we know this? Only a novice would buy AFTER an advance in price and INTO a price level where supply exceeds demand. Our job is to find this novice buyer and simply take the other side of his or her trade. When you enter markets at price levels where supply and demand are out of balance in a big way, especially at or near the open of trading, moves in the market are typically very fast. All it takes is about 30 minutes of morning prep work that I and my team do each day that anyone can do if you understand supply and demand and how to see it on a price chart. I took this trade in the NASDAQ, not the Russell but used the Russell and other markets to make this decision. The goal of this article is to impress upon you the importance of looking at markets for what they really are which is simply an ongoing supply and demand relationship. Opportunity exists when this simple and straight forward relationship is out of balance. Everything else in and around markets is just “noise” that is meant to invite you into markets at the wrong time and in the wrong direction. As an educator, I say that is unfortunate. As a trader, I love it, the more noise the better!